An experimental aircraft has set a new record for thelongest hypersonic flight after streaking across the sky Wednesday for morethan three minutes while flying at Mach 5 ? five times the speed of sound ? theUnited States Air Force has announced. The vehicle, called the X-51A Waverider, dropped from aB-52 Stratofortress mother ship while flying over the Pacific Ocean just offthe southern California coast. It successfully ignited an air-breathingscramjet engine than accelerated up to Mach 5, Air Force officials said in theannouncement.? The entire test flight lasted just over 200 seconds, morethan 10 times longer than the previous hypersonic record (just 12 seconds) setby NASA'sX-43 vehicle in 2004. 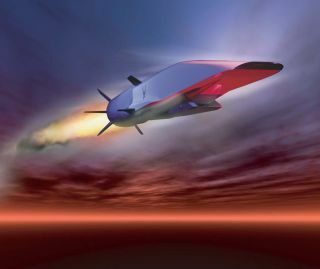 "We are ecstatic tohave accomplished most of our test points on the X-51A's very first hypersonicmission," said X-51A program manager Charlie Brink of the Air ForceResearch Laboratory at Wright-Patterson Air Force Base in Ohio, in a statement. "We equate this leap in engine technology as equivalent to the post-WorldWar II jump from propeller-driven aircraft to jet engines." Wednesday's test flight wasaimed at evaluating the X-51A's scramjet engine, thermal protection, stabilityand control, and other systems. With a profile that gives ita shark-like look, the X-51Ascramjet cruiser is 14 feet (4.2 meters)long and is virtually wingless. It is designed to ride the shockwave it createsduring flight, leading to its nickname "Waverider," the Air Force hassaid. Pratt & WhitneyRocketdyne built the SJY61 scramjet engine at the heart of the X-51A cruiser. The Air Force beganWednesday's test at 1 p.m. EDT (1700 GMT), when the B-52Stratofortress hauling the X-51A took off from EdwardsAir Force Base in California. The X-51A test craft dropped from its mother shipwhile flying 50,000 feet (15,240 meters) over the Point Mugu Naval Air WarfareCenter Sea Range on the Pacific Ocean.? Four seconds into theflight, the X-51A's solid rocket booster ? actually an adapted Army TacticalMissile booster ? accelerated the experimental aircraft to Mach 4.8 beforebeing jettisoned to let the scramjet engine take over. After the flight, thevehicle was expected to splash into the ocean. There were no plans to recoverthe craft, according to the Air Force. "Now we will go backand really scrutinize our data. No test is perfect, and I'm sure we will findanomalies that we will need to address before the next flight," Brinksaid. "But anyone will tell you that we learn just as much, if not more,when we encounter a glitch." The test was actually thethird flight of the X-51 vehicle; it was the first time it flew independently.It had remained attached to its mother ship on both earlier flights. Three more X-51 hypersonictests flights are scheduled for later this year. The Air Force has built fourX-51A cruisers in all, with one of them now successfully flown. The project is a jointeffort by the Air Force Research Laboratory, industry teams and the DefenseAdvanced Research Projects Agency (DARPA). Hypersonicflight, typically defined as beginning at Mach 5, is morechallenging than supersonic flight at lower speeds because of the highertemperatures and pressures involved with the faster flight speed. The speed ofsound, Mach 1, is about 760 mph (1,223kph) at sea level. Conventional turbine jet engines can't handle suchspeeds, Air Force officials said. But scramjets, air-breathing jet engines driven bysupersonic combustion, like the one on X-51A have their own challenges too. AirForce project officials compared it to "lightinga match in a hurricane and keeping it burning." The X-51A is not the U.S.military's only project undergoing tests this year. The Air Force Research Laboratoryand scientists in Australia successfully launched an unmanned suborbital rocketin March during a joint hypersonic flight test that hit Mach 5.5. In late April, an unmanned hypersonicglider called HTV-2 failed duringits test flight after blasting off on a rocket launched from Vandenberg AirForce Base in California. That test, too, was aimed at learning more about theintricacies of hypersonic flight to support the development of future aircrafttechnology. The Air Force also launchedthe secretive X-37B space plane into orbit in late April from the CapeCanaveral Air Force Station in Florida. The exact mission of that reusablespace plane, which is smaller than NASA's space shuttles but entirely robotic,is closely guarded. But amateur skywatchers have managed to spotthe mysterious X-37B inthe night sky using telescopes equipped with video cameras.